Energy efficiency is the largest and most affordable energy resource that we have in Maine, and it is still largely untapped. With the formation of the Efficiency Maine Trust in 2009, Maine is beginning to take the right steps to maximize our cost-effective energy efficiency potential, save millions of dollars, and create jobs for Maine people. But there is so much more we can and need to do. 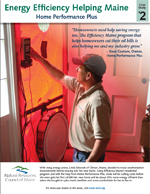 Read some Maine case studies below to learn more about how businesses and homeowners are saving money, increasing their energy security, and creating jobs with energy efficiency. Also, learn how efficiency improvements benefit your county. 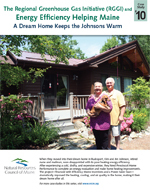 Learn more about the successes of energy efficiency in Maine and why we need to build on them. Maine faces high energy costs—Maine residents and businesses shell out about $7.5 billion for energy bills each year—mostly for imported oil, gas, propane, and for electricity (56% of which is from fossil fuel generation). Energy efficiency can reduce this dollar drain significantly. Becoming just 20 percent more efficient, for example, would put an additional $1.5 billion dollars in Mainers’ pockets. Energy efficiency is the lowest cost energy source around.Efficiency Maine saves energy at 3.6 cents/kWh — a cost 60% lower than the cost of electricity. 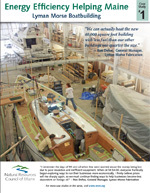 Efficiency Maine provides technical assistance; grants, loans, and tax credits; training; and quality assurance. Efficiency Maine is the state’s initiative to save energy and money through energy efficiency improvements —and it has a proven track record of success in delivering cost-effective savings from efficiency. Since it began in 2004, Efficiency Maine has saved Maine people and businesses nearly $490 million on their energy bills by investing only $80 million in public funds, which were matched by $86 million in private dollars. Efficiency Maine had saved as much total electricity in its first five years of operation as all Maine households use in one year. The programs help homeowners, business, towns, schools, hospitals, and others make wise, cost-effective investments in energy efficiency. Efficiency Maine generates $3 in energy savings and $4 in Gross State Product for every $1 spent. 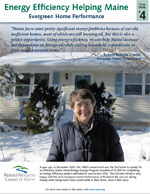 In 2010, Efficiency Maine developed a three-year plan, with a greater emphasis on heating oil, that will save Mainers $840 million and increase the state’s GSP by $1 billion. Efficiency Maine’s efforts are one of the reasons why Maine’s clean energy sector now employs more than 4,000 people, and is growing seven times faster than the state’s overall job market. Energy efficiency saves money for all ratepayers. 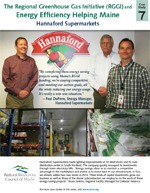 Energy savings reduce the flow of dollars out the state for fuel. These dollars get spent in the Maine economy instead. Efficiency helps reduce peak demand, which also provides savings to all ratepayers, about $500 million for Maine ratepayers in its first five years of operation. The more we can use energy efficiency to replace expensive oil, gas, and electricity, the lower Maine’s energy bills will be. 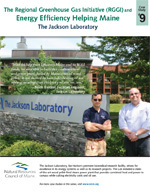 Federal stimulus funding allowed Efficiency Maine to boost its offerings for the last two years. This funding has run out, but the need for energy efficiency improvements remains. 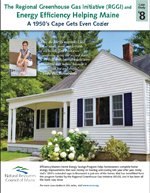 One success that is worth building on is the Home Energy Savings Program (HESP), which is dedicated to helping Maine homeowners reduce oil consumption through efficiency improvements and weatherization. In twelve months, HESP helped weatherize more than 1,600 Maine homes, saving each about $1,000, or 360 gallons of heating fuel, every year. Weatherizing through this program costs $1.80/gallon of oil saved, while today oil costs more than $3.60/gallon burned (as of March 2011), demonstrating once more that efficiency is the cheapest source of energy. 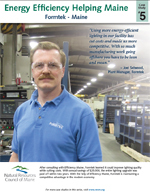 The stimulus funding has also enabled Efficiency Maine to offer competitive energy efficiency grants to help nearly an additional 100 Maine industrial and commercial businesses. Maine cannot build an energy efficient economy by responding to the peaks and valleys of oil prices. Over the past two years, with stimulus finding, Maine has created momentum and infrastructure for energy efficiency improvements. Now, Maine needs a longer-term strategy to maximize energy efficiency and weatherization in our homes and businesses, boost business growth, and slash energy costs. Maine’s economy will needlessly suffer and we will fail to achieve needed energy cost reductions if we do not increase investment in energy efficiency. Full funding for energy efficiency programs is necessary to sustain the jobs, knowledge, and infrastructure needed for an energy efficient economy. This session (2011), the Legislature has the opportunity to help Maine citizens and businesses reduce electricity costs by approving Efficiency Maine’s proposed budget. A vote against the proposed budget is a vote for higher energy costs. At the public hearing in April 2011, Central Maine Power and the largest industrial energy consumers and all other testimony were in support of Efficiency Maine’s proposed budget — no one testified in opposition. **Underlined emphasis added in the above quotes.